Last week the public clocks which the punctual Dutch had placed along Batavia’s sweltering, mosquito-infested streets did not say; nobody had wound them. Nobody collected electric bills, because the electrical engineers are Dutch and the company accountants Indonesian; they could not decide who should get the receipts. Batavia had two mayors, one Dutch, one Indonesian; two flags, one Queen Wilhelmina’s and one Ir. Soekarno’s; two currencies, neither of which could buy much, and two possible destinies: it might become the chief city of the first great Moslem colony to free itself from European rule, or it might come to symbolize the first wave of Asiatic nationalism to break into chaos. Last week at The Hague, Johannes A. Jonkman, Minister of Overseas Territories, struggled with the job of putting Citizen de Jong’s fears into political terms. Jonkman, who lost all his hair in a Jap prison camp in the Indies, worked so hard to draft his speech to The Netherlands States-General that friends feared his health would break down. After he made the speech, interpreting the proposed pact between the Dutch Government and Soekarno’s rebel Indonesian government, Holland’s politicians and people were still as unhappy and undecided about the issue as Pieter de Jong. The pact recognizes Sumatra, Java and little Madura as the Republic of Indonesia, whose degree of independence will be great, but is deliberately left vague. Borneo and the Great East (see map) will be left under Dutch control. Both the Dutch and the Indonesian nationalists agree to work toward a federation which would bring the whole Netherlands East Indies into a future United States of Indonesia, a sort of Dominion under the Dutch Crown. Further negotiations to clarify the pact are expected. Meanwhile, the Indonesians think that events are moving too slowly toward independence, and the Dutch think they are going too rapidly. The Dutch are hurt and bewildered at what they consider native ingratitude. For generations the Dutch regarded themselves as the world’s model colonizers. Now their very benefactions are turned against them. They introduced sanitation and Western medicine, and raised the standard of living. Result: the Javanese population rose from 35,000,000 in 1920 to 42,000,000, became too big for little Holland (9.000,000) to handle. The Dutch raised the shamefully low literacy rate to a less shameful 10%. Result: educated Indonesians became the worst enemies of the mother country. The Dutch established some safeguards against big business exploitation of the natives. Result: Indonesian leaders, some of whom are rich, now feel that they can manage their fabulously rich archipelago (37% of the world’s rubber, 3% of its oil, 91% of its quinine), preferably through public ownership of key industries. Disanalah dku berdiri, mendjaga pandu ibuku. At the end of each speech he punches out, with clenched fists, three thunderous cheers: “Merdeka [Freedom]! Merdeka! Merdeka!” His followers roar the word, plaster it on billboards, use it as the Nazis used Heil Hitler in telephone greetings. Affectionately, they call their leader “Mister Merdeka.” He could do with a nickname. Soekarno is his first name, and it is almost as common in Java as Hans is in Holland. Indonesians are careless about surnames, and Soekarno lost his somewhere along the rocky way of a life that began humbly in Surabaya. Young Soekarno was one of those bright, indifferent students who frequently turn out to be politicians. He set out to become an architect. At the Bandung Technical Institute he got a degree in civil engineering, which entitles him to put Ir. in front of his name (Ir. is a contraction of ingenieur, Dutch for engineer). Soekarno’s architectural career was as short as his professional title. He designed a few Chinese homes and was commissioned to do a Moslem mosque (most Java mosques are hideous tin-roofed stucco monstrosities, in contrast to the lovely ruins of the vanquished Hindu temples). Soekarno gave up architecture. But though politics has been his occupation, he has not lost his interest in art. His Batavia house contains one of the finest collections of Indonesian paintings, especially moonlit mountain and jungle scenes. His favorite artist is the younger Abdullah, who painted a hauntingly lovely portrait of Soekarno’s present wife (he married her because his first wife bore him no children; by the second he has a young son). When Soekarno was paid 800 guilders a month by the Japs, he used to give Artist Abdullah 100. At an early age he read Shakespeare, Lincoln, Rousseau, John Dewey and Santayana—a mixed bag of Western thought that may have contributed to the confusion and indecisiveness that runs through his political career. Soekarno, like thousands of other young Indonesian intellectuals, was a wavering moderate in his opposition to Dutch rule. In 1926 the Dutch made a major blunder. In suppressing a Communist uprising, they exiled 4,500 Indonesians, without trial, to New Guinea. Soekarno became an uncompromising (but nonCommunist) nationalist, reached out for power, achieved a considerable following before being exiled to Flores Island in 1934. Soekarno’s career well illustrates how intensely the natives felt about the Dutch. Soekarno rounded up thousands of his countrymen, who later died as Jap slave laborers in Borneo and New Guinea. Half a day after the bomb dropped on Hiroshima, he was still boasting that “thousands of Indonesian youths have entered the ranks of [Japanese] suicide squads.” Yet when the Japanese Army proclaimed the Indonesian Republic (on Aug. 17, 1945, two days after Japan surrendered) and appointed Soekarno President, the Indonesians greeted him with acclaim. Had the Allies landed immediately, Soekarno’s career would have been cut short. But in the six weeks that elapsed before British troops, under Lieut. General Sir Philip Christison, arrived in Java, Soekarno had a chance to consolidate his “independent” government. Christison gave Soekarno another break by announcing, “I am not going to Java to return the country to the Dutch.” Soekarno used this statement to build up his people’s confidence that they could successfully resist the return of imperial rule. For 14 months the Republican Army fought British and Dutch occupation troops. By the time the British withdrew last month their casualties were 600 killed, 1,320 wounded and 320 missing. The Indies Dutch, many of them jittery after years in Japanese concentration camps, underestimated the nationalist movement. One Dutch matron summed up their tragically mistaken attitude: “All the natives want from this world is three things: an umbrella, a pair of slippers and a bicycle.” One conspicuous exception to this complacency was Dr. Hubertus van Mook, the urbane, Java-born diplomat, who returned to Java as Acting Governor General convinced that the Dutch had to make major concessions. Because van Mook at first had refused to treat with collaborators, Soekarno induced a rival native leader, Sjahrir, to become his Prime Minister—a move that turned out to be the smartest Soekarno ever made. 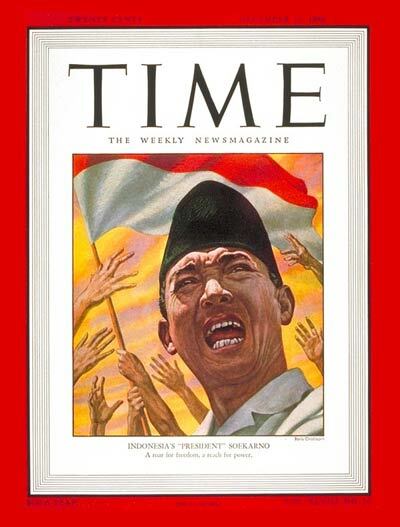 Smoother and brighter than Soekarno, and with a clean anti-Japanese record, Sjahrir had everything—except the adulation of the Indonesian masses. Sjahrir quickly adjusted himself to the role of Soekarno’s front man in Batavia, while Soekarno left Batavia for the cool hill city, Jogjakarta, where he could indulge both his love of comfort and his sense of historic irony. Soekarno luxuriated in the terraced, marble-floored mansion that once belonged to the Dutch Resident. Near the mansion are the ruins of Borobudur, the massive Buddhist temple where Java’s kings worshiped eight centuries before the Dutch came to the archipelago. Said Sjahrir: “When your troops leave Indonesia I’ll say things twice as nice about the Dutch.” Meanwhile British diplomacy, first in the person of Sir Archibald Clark Kerr (now Lord Inverchapel), who was succeeded by Lord Killearn, continued its efforts to bring the Dutch and the Indonesians together. Former Dutch Premier Willem Schermerhorn, who had blamed van Mook for dealing with collaborators, came out to Java and soon found himself discussing the situation over Scotch & soda with Soekarno, whose Mohammedanism is not so rigid that he scorns a drink. The pact now before the Dutch States-General was drafted last month at Linggadjati. There, with Lord Killearn in the chair, Schermerhorn, van Mook and Soekarno (Sjahrir had one of his frequent colds) haggled out an agreement. The issue finally boiled down to a sentence in Article 2 which referred to Indonesia as a “free democratic state.” Soekarno’s Economics Minister, 38-year-old A. K. Gani (who once acted in a Batavian-made movie True Love), objected: “That word ‘free’ is not enough. It should be ‘sovereign.’ ” Van Mook turned to Soekarno: “Will you accept the agreement if it is changed to sovereign?” Almost before he knew it, Soekarno said yes, and the agreement was signed. Today, while the Indies wait upon The Netherlands’ reaction to the pact, a truce—but no peace—prevails in Indonesia. The Indonesian Army, led by hotheaded young General Soedirman, continues to snipe at units of the 92,000 Dutch troops under Lieut. General S. H. Spoor. Actually, in Java the Dutch hold only three small areas: the cities of Surabaya, Semarang and a corridor two to six miles wide connecting and including Batavia and Bandung. Of Java’s 51,000 square miles, the Dutch hold perhaps 380 square miles. In Sumatra the Dutch control three areas (at Palembang, Padang and Medan), less than 76 square miles out of 164,147. In Batavia last week some of the old, prewar hallmarks of empire were still present. The tuan besar (Dutch for pukka sahibs) sat in their white linen suits and drank fiery Bols gin on the terrace of the Harmonie Club. Every now & then in the evening their talk was disturbed by a bullet whizzing by from the lines outside the city. News more disquieting than casual bullets came last week. The Dutch had assumed that their friends, the local sultans of the Great East islands, would not be troubled by rebellion. But now there was insurrection in Celebes, and even reports of trouble in Amboina, where Indonesia’s most loyal native troops are recruited. * After Holland was liberated, Queen Wilhelmina gave Starkenborgh an audience in The Hague. He drove to the palace in his automobile, sent the driver back because he was sure the audience would last several hours; doubtless the Queen would have him to lunch. Much to his surprise the Queen ended the interview in 15 minutes. Starkenborgh went home by trolley. This entry was posted in History, Indonesia. Bookmark the permalink. Comments are closed, but you can leave a trackback: Trackback URL.